On this special edition of Ancient Faith Presents, Fr. 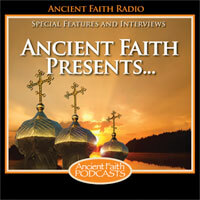 Evan Armatas, priest at St. Spyridon Greek Orthodox Church in Loveland, Colorado, and the host of Orthodoxy Live on Ancient Faith Radio, speaks at Holy Apostles Orthodox Church in Cheyenne, Wyoming. Holy Apostles holds an annual dinner in the Cheyenne community to raise funds and awareness about Orthodoxy. Each year they invite a keynote speaker to address their guests and speak about the Faith. This year the host committee asked Fr. Evan. The event occurred outside of Cheyenne at the historic Shellback Ranch on July 19, 2016. Fr. Evan explains Mark 4:13-25. Fr. Evan moves ahead to Mark 4:26-32. Fr. Evan discusses Jesus's use of parables and then tackles the Parable of the Sower.